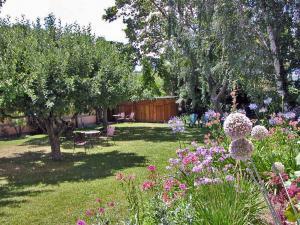 Take a Garden Bed and Breakfast Tour! 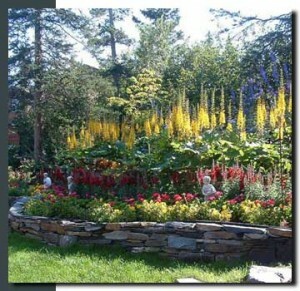 Winner of the 2005 Best of Gardens prize given by the Anchorage Botanical Garden, the Alaskan Frontier Gardens Bed and Breakfast is a wilderness garden retreat. Set in a custom cedar house among the pines close to Chugach State Park, this B&B’s lush lawns are edged by gardens filled with 8 foot tall delphiniums in various shades of purples, blues, and pinks. (Guests are encouraged to relax and enjoy the stars and Northern Lights from the Alaskan Frontier’s large decks and eight-person hot tub). Inside, soft plush linens float over the finest mattress sets in the guestrooms; with fluffy pillows and European goose down comforters secured inside luxurious duvet covers and shams. As for breakfast? Guests awaken to the aroma of Belgian waffles with rum peaches, Amaretto French toast, Alaskan blueberry pancakes, a variety of Alaskan syrups, reindeer sausage, gourmet coffee, herbal teas, fresh seasonal fruit, cereals and juice. Yum! California’s Solvang Garden Lodge is located in the Dane-settled village of Solvang, which some have described as being ‘more Danish than Denmark’! Certainly this B&B is the epitome of old world charm; including its wonderful gardens that surround the Lodge with constant color. Thanks to the warm weather of this area – which is why the Danes called it Solvang, for “Sunny Field” – flowers thrive; gracing this B&B with stunning roses and lilies. There’s even an orchard! 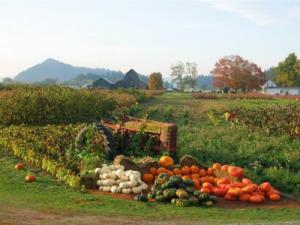 Imagine lush fields during summertime, and blazing leaf colors in fall; accompanied by apple harvests, corn mazes, and pumpkin patches. Throw in wonderful rows of tulips, daffodils, and irises during the mild Washington state springs, and voila: You’ve captured the essence of the Queen of the Valley Inn Bed and Breakfast. Located on Mount Vernon near the Pacific Coast, the Queen lives in a 1900-era three-story “American Foursquare” farmhouse. Renovated in 2004, this B&B offers period-decorated bedrooms and great breakfasts on its sun porch. “The Queen never serves Spam, processed cheese-food, or any form of soup from a can,” declares its website. “Our proper breakfasts feature locally grown produce and seasonal specialties from the Skagit Valley and around the northwest. You call it breakfast. We call it ‘love on a plate’.” By the way, even when the Queen’s gardens are blanketed in snow, this B&B is a great place to bird-watch bald eagles, snow geese, and trumpeter swans.